I recently had a terribly frustrating problem with the Kontakt 5 sampler incorrectly loading Native Instruments and third-party commercial libraries which took many combined hours of my time to investigate, experiment with, and ultimately fix. I couldn't find any information on the internet that pointed to a solution (or even a cause) for this problem; I was completely on my own. I am documenting the ordeal here for any unlucky travelers who run into the same issue. Please note: I am a Windows user, and I don't know if this problem or its solution translate to Mac OS. 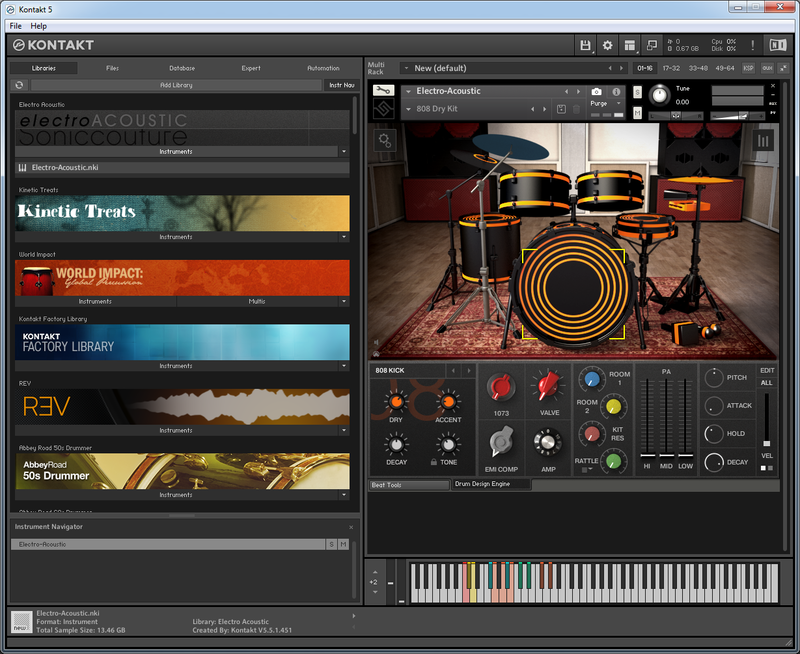 As shown in the image, all controls from all of the plugin's built-in tabs are visible all at once, rendering the user interface (UI) unreadable. Additionally the highlighted keyswitches shown on the virtual keyboard are all wrong. Again, all UI elements of the instrument were displayed on-screen at once, and none of them were usable. When launched as a plugin in Ableton Live 9, Kontakt behaved just the same as in stand-alone mode. It was even worse in Steinberg Cubase 9, though. In Cubase, after opening a new instance of Kontakt and selecting a library, Kontakt would spend some time loading samples, but then would eventually freeze, locking up Cubase entirely. It wouldn't display the instrument UI at all, and since Cubase was unusable, the only way to exit it was to kill the process in Task Manager. Here's a quick list of things I observed over the next several days in my quest to solve the problem. 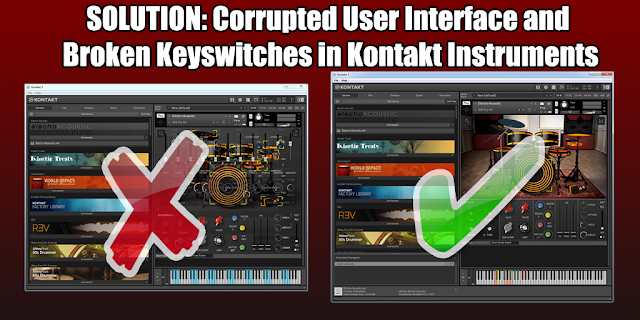 The problem only affected stand-alone mode and new instances of the Kontakt plugin in a DAW, not plugin instances that had already been saved in existing Cubase projects. I even had a couple of projects that used Soniccouture Electro-Acoustic (the instrument I was using when I discovered the whole problem) which loaded and played fine. 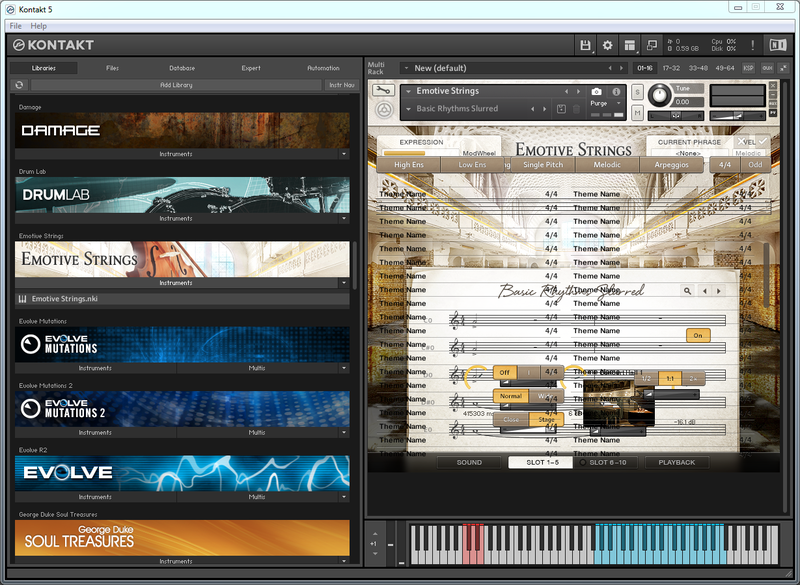 It was only when I added a new instance of Kontakt to a new or pre-existing project that the issue occurred. Updating to the latest Kontakt version didn't help. I don't know exactly which version I had installed when I first hit the issue, but I checked Native Access and saw that there was an update available (5.6.8). I installed the update but found that it did not fix my issue. I normally use Windows 7, but I have another boot partition with Windows 10, that also has Cubase and Native Instruments Komplete 11 installed. When I switched over to Windows 10 and tried loading some of the same libraries that were giving me problems on Windows 7, I found that they worked fine. I also ran Native Access to make sure all my plugins were the same version I was running in Windows 7, so this ruled out the specific version of Kontakt. Version 5.6.8 was not the problem. Here was the real breakthrough, though: After I switched back to Windows 7 I logged into a different user profile that I hardly ever use. 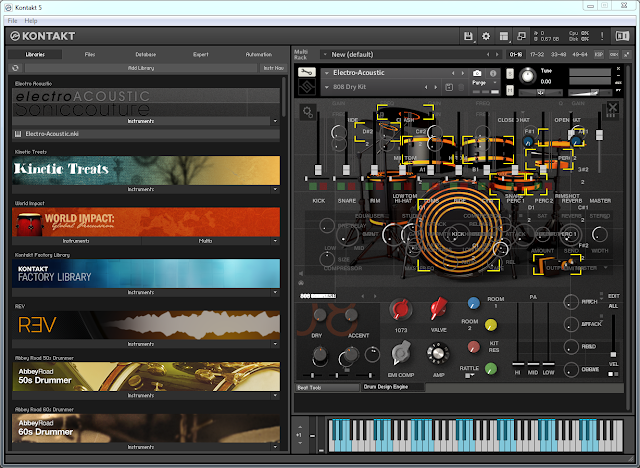 I launched Kontakt in stand-alone mode, and loaded Electro-acoustic... and this time it worked! Both the UI and keyswitches were now working properly! This told me it wasn't an installation problem, but rather something specific to my Windows user account. On this working user profile, I ran Sysinternals Process Monitor while launching Kontakt and loading the Soniccouture instrument again, watching exactly what Kontakt 5.exe was doing- and this is when I saw it: Kontakt was using a registry subkey that I had overlooked previously, when I was doing manual post-uninstall cleanup of Kontakt. I had already been deleting the Kontakt-related keys under HKEY_LOCAL_MACHINE, but I had forgotten to check for anything under the user-specific portion of the registry: HKEY_CURRENT_USER! Make sure no instances of Kontakt are currently running, either as a stand-alone program or a plugin. With the Kontakt 5 node selected in the left pane of the window, select File > Export and save a backup copy of the registry contents. Now right-click the Kontakt 5 node and click Delete on the shortcut menu. Quit Regedit and re-launch Kontakt. Load a library that was exhibiting the problem with the UI and/or keyswitches previously. It should now work. This also fixed the problem with new instances of the plugin in Live and Cubase. I really hope this post saves someone the time and frustration this problem caused me.